Beyerdynamic overhauls DTX/MMX in-ear headphones range | What Hi-Fi? 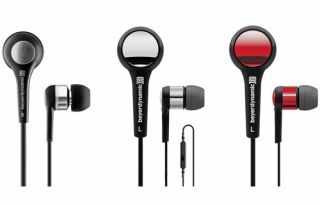 More than three years after first launching, the DTX/MMX series of in-ear headphones from German audio manufacturer Beyerdynamic have been given a "state-of-the-art makeover". The company's buds have a track record of impressing us, with the five-star DTX 101 iEs and MMX 101 iEs both scooping gongs in our 2013 Awards, while the DTX 71 iEs weren't far behind. According to Beyerdynamic, "things are known to progress a lot faster in the world of smartphones and tablet PCs than in other areas of entertainment electronics". With this in mind, the firm has equipped the DTX 72 iE and DTX 102 iE (below) headphones and the MMX 102 iE headset with a softer, more flexible connection cable. The manufacturer says the new cable is "less likely to get tangled" and can be stored in an artificial leather case with snap seal, while offering "less mechanical vibration". Meanwhile, silicone ear moulds in three sizes have been designed to ensure a secure, comfortable fit and a light coloured finish has been introduced alongside the black/silver option. For gamers, Beyerdynamic's upgrade of the MMX 102 iE (above) will see the headset incorporate a hands-free microphone and remote control in the cable, plus a VoIP adapter for Skype calls. The DTX 102 iEs (€79) and MMX 102 iEs (€89) are now available, while the DTX 72 iE (€59) will follow in May. All three can be bought from selected retailers or direct from Beyerdynamic.